When the team news was released it appeared that City were going to line up with three at the back. Aymeric Laporte and Nicolas Otamendi were both selected, but with no recognised left-back it appeared that they would form a back three with Kyle Walker. In practice, however, we saw Fernandinho positioned as the right-sided central defender when City were in their defensive phase. As we will see later on, though, when City are in possession the structure changed with Fernandinho rotating into the midfield. 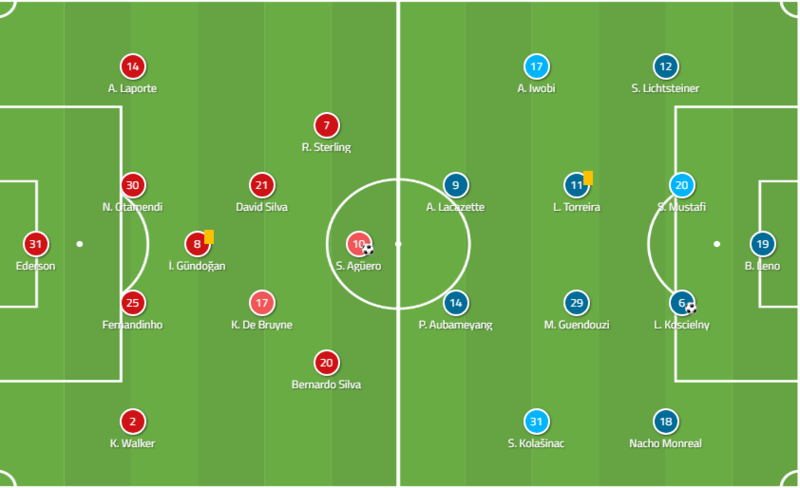 The Arsenal structure was equally interesting with Unai Emery opting for a 4-4-2 structure featuring both Pierre-Emerick Aubameyang and Alexandre Lacazette in attack. 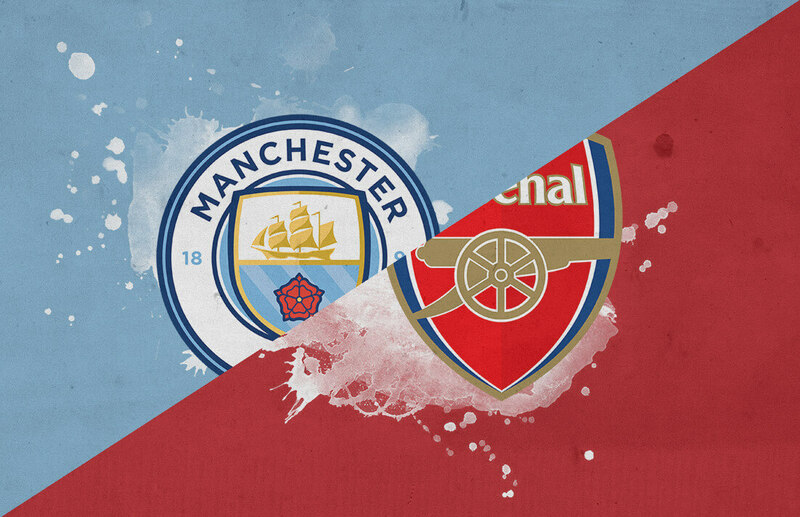 One of the tactical keys to the match would surround the ability of City to operate in pockets of space in between Arsenal’s midfield and defence. As mentioned above we saw Manchester City employ an interesting mechanism when they were in possession in order to create numerical and positional advantages in the build-up phase. 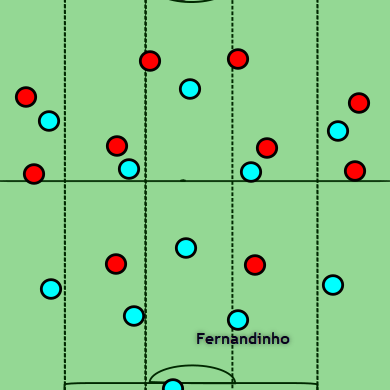 These mechanisms surround the Brazilian midfielder Fernandinho. In the 4-3-3 structure that we most often see from City Fernandinho is firmly entrenched as the controlling midfielder or number six at the base of the midfield. In this match though, we saw Fernandinho used in a far more flexible role as he rotated between the defensive line and the midfield. Out of possession we saw City adopt their usual 4-3-3 structure, but with the German international Ilkay Gundogan playing at the base the midfield. This saw Fernandinho slot into the defensive line alongside Nicolas Otamendi with Aymeric Laporte on the left and Kyle Walker on the right. This choice fully underlined the faith that Guardiola has in the qualities of Fernandinho given that Aubameyang and Lacazette look to play on the shoulder of the last defender and attack the space behind at pace. The defensive qualities of Fernandinho would be tested to the full. We should make no mistake that this was not an easy choice defensively. 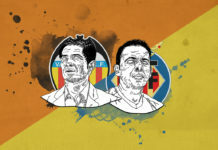 Often a top team can take a chance in terms of their personnel against a weaker opponent, but Guardiola had the confidence in his side to use this structure in a match against a top-six rival. When they were in possession we saw a vastly different structure from City as Fernandinho rotated from the defensive line to his more regular position at the base of the midfield. Here, instead of operating as a single pivot, he played on the same line as Ilkay Gundogan to form a double pivot. This movement meant that there was limited forward movement from Laporte at left-back and Walker at right-back as they formed a back three with Otamendi. With that said, however, we still saw both Laporte and Walker provide supporting angles behind the wide forward when they were in possession. This was a sign of the positional dominance that City enjoyed in this match. With Fernandinho and Gundogan playing together as the double pivot in midfield, City had an incredibly strong base from which to build up in the attacking phase. If the two Arsenal forwards looked to press high, then the ball would be slipped past them to one of the two deepest midfielders. If the two Arsenal forwards looked to drop back and defend in front of the two City midfielders, then Otamendi, Laporte and Walker would provide the impetus in the build-up phase. If the movement of Fernandinho into the second line provided the starting point for City in the build-up phase, it was the positioning and movement of David Silva and Kevin De Bruyne as the two eights that provided the positional superiority in the final third of the pitch. As mentioned above we saw City enjoy two clear options when looking to play into the central areas. These were predicated on the positioning and pressing of the two Arsenal forwards. What we saw increasingly more often as Arsenal went behind and had to chase the ball was that Lacazette and Aubameyang would push high in order to pressure the first ball from the City defensive line. This left the two central midfielders for Arsenal, Lucas Torreira and Matteo Guendouzi, to push on and prevent comfortable possession for City’s double pivot. These movements, in turn, gave City the capacity to dominate the final third with David Silva and Kevin De Bruyne operating on a high line in the half-spaces. City were able to rotate the ball comfortably across their defensive line, where they enjoyed a 3v2 advantage over the two Arsenal forwards. This meant that there was always a free player on the first line, usually in the half spaces. By rotating the ball in this manner City were able to find vertical passing lanes into Silva and De Bruyne who were operating in pockets of space for most of the match. Here is where the 4-4-2 for Arsenal broke down. They were unable to effectively close down the passing lanes and options for City and they found themselves consistently outplayed as City entered into the final third. As the ball was fed into either player in the half-space City would find themselves in a position to create immediate overloads against the Arsenal defensive line. Here we saw Laporte in possession on the left side of the first line for City. He was able to play a comfortable vertical pass into the feet of David Silva who had space to receive comfortably. When taking possession of the ball in these areas Silva then had at least three options. He could turn and attack space, set the ball back to one of the two controlling midfielders or wait for the diagonal pass from either Sergio Aguero or Kevin De Bruyne that would threaten the space in front of him. There is something that you might have noticed when watching City under Guardiola: they score the same goal over and over again. 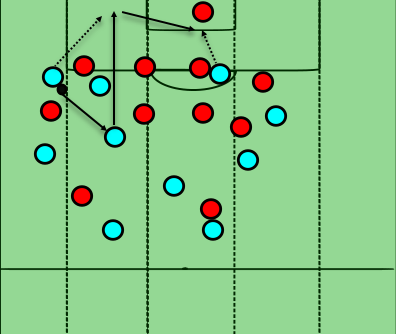 The ball is initially with the wide forward with an opposition full-back pressing the ball. The pass is made back to a midfield player at a supporting angle and the wide forward takes off at an angled run into the penalty area. The pass is played into the path of the wide forward with perfect weight and is, in turn, played across the face of the goalkeeper for a City player to tap into the net. The movements are relatively simple and the fact that we have seen them over and over again should see opposition coaches able to plan to negate these patterns. In fact, the opposite is true. The explosive nature of the wide forwards with their diagonal movements makes it difficult to stop the run from being made. The technical qualities of the midfielders also mean that the pass is often perfect. We saw these movements executed to perfection in this match. As Leroy Sane set the ball back to Ilkay Gundogan, the return pass was lofted and weighted expertly to meet the run. From that point on it was a simple matter for the ball to be squared across for an easy goal. These combinations that City played in the final third were too much for Arsenal. Their defensive line was too static, leaving little pressure on the ball by an outmatched midfield duo. City simply rotated the ball and overloaded space in the final third. For the second match in a row, we saw City take the lead in the first minute only to be pulled back by an initially stubborn opponent. Unlike the match against Newcastle United though, City were able to continue to find space in which to operate in and around the final third. The superiority that City enjoyed with a 4v2 overload in the centre of the pitch saw them find spaces in which to play in and around the final third. 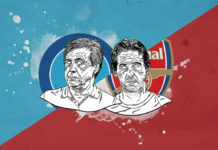 Arsenal never threatened properly as they were unable to build up effectively to create chances for their two forwards. The title race is very much still on.